PESHAWAR: Khyber-Pakhtunkhwa (K-P) Chief Minister Pervez Khattak on Thursday broke ground on the long-awaited, multi-billion-rupee Bus Rapid Transit System to provide comfortable transportation to the residents of Peshawar. The groundbreaking ceremony was arranged near the northern bypass in Peshawar which was attended by the CM, K-P Assembly Speaker Asad Qaiser, secretary transport, Director General Peshawar Development Authority and representatives of stakeholders in the project. 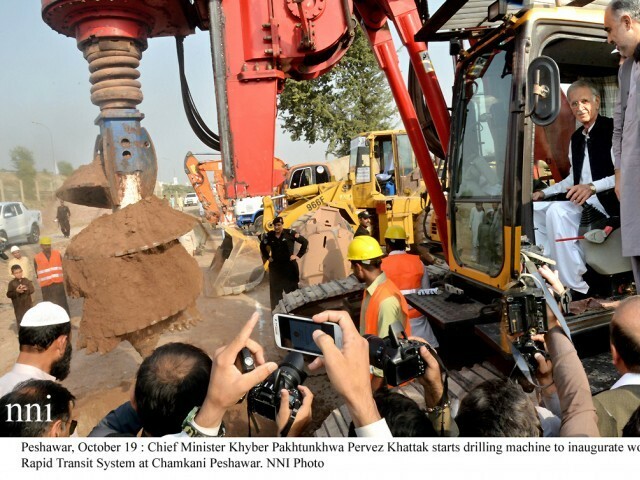 Khattak operated the driller for breaking the ground to kick off the construction work starting from the Chamkani area of the city. The CM, while addressing the ceremony, said the contractors have been directed by the government to complete the project in six months without any delays. “Almost 0.4-0.5 million passengers would use the BRT on a daily basis and no subsidy would be given for the project,” Khattak claimed, adding, it’s one of the three mega projects to be executed by PTI which would provide ease of transport to Peshawarites. The K-P CM said around Rs30 billion will be spent on the entire project while Rs4 billion would be spent on building/commercial plazas in the city for making the BRT system more feasible in the city. Khattak said that a total of 80 buses will operate under the project on the main route while the rest of the fleet of more than 300 buses will be deployed on eight feeder routes including Kohat Road, Ring Road, Charsadda Road, and Hayatabad. Those affected, he said, will be compensated by the government for which Rs1 billion has been set aside. “The project will give a new look to Peshawar,” he added. Speaking about delays in the project, Kattak claimed that first the provincial government had planned to use the Railway track for the project but they were not given the permission [by the federal government] which led to delays in the project. “Loan sanction from ADB for the project took about two years,” he added. The CM informed the audience that the government was also planning to inaugurate the circular railway project under CPEC which will connect Peshawar, Charsadda, Nowshera, Mardan, Swabi and Malakand. The 26-kilometere BRT project will start form Chamkani and will end at Shaukat Khanum Cancer Hospital in Hayatabad, with a total of 31 stations along the route. The documents available with The Express Tribune show that total cost of the project would be over Rs61 billion. The document also contradicts the claims of the CM that the project will cost Rs57 billion. While it also expected that the project would be completed by March 2019. The K-P government has taken a loan of Rs35 billion from the ADB for the project for a period of 20-years, while over Rs7b each would be provided by European Investment Bank and Agency France Development. Moreover, 10% of the total employment positions have been reserved for females in various connecting departments of the BRT. The documents also claimed that the BRT would reduce carbon emissions. 31,000 tonnes of carbon dioxide emissions will be reduced in first year of the project’s operations while it is estimated the emissions will fall by 62,000 tonnes which will significantly decrease pollution.